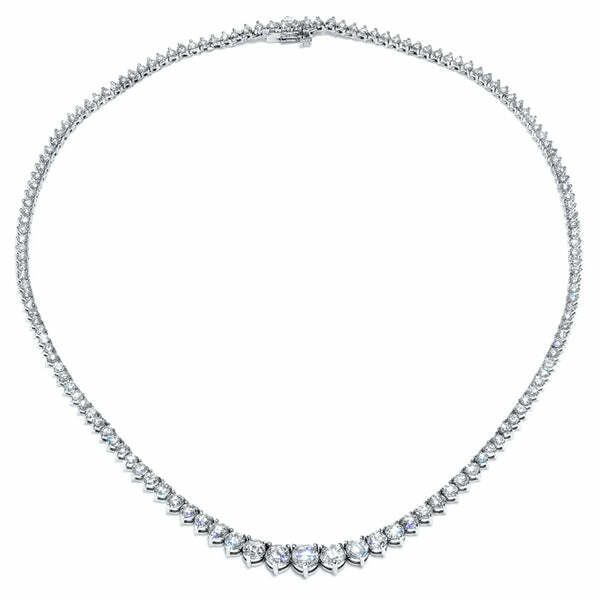 Recently, a customer placed an order for our 10.00cttw diamond riviera necklace. Lucky lady, huh? Even though this looks like a straightforward, easy to manufacture necklace, you would be surprised at the amount of work that goes into manufacturing a piece like this. First, we need to cast and manufacture the necklace mounting as the customer purchased it. In this case it was cast in 14kt white gold with a length of 16 inches. Once the necklace is out of casting, the next step is to have it pre-polished. The polisher also inspects the piece to verify that there are no defects from the casting process. An example of a casting defect could include porosity. At the same time that this necklace is being inspected and polished, about 30 carats of diamonds are being sorted by one of our in-house staff GIA graduate gemologists. There are a lot of moving parts when making a piece like this even in terms of selecting the diamonds that will go into the necklace. The things that we need to consider are the overall carat weight, the mm size of each diamond, the color and clarity of the diamonds, and executing the proper graduation of the diamonds to be used. Phew! See? And I bet you thought this was easy! After the necklace is pre-polished and the diamonds to be used have been sorted, the diamond setter begins the process of setting all the diamonds. Occasionally, some diamonds may have to be swapped out, but this is all part of the process. For us, it is critical to know the exact number of diamonds used as well as the exact final diamond carat weight. This is important for a few reasons: 1) We want to be as close to the advertised carat weight as possible and 2) We need the final carat weight for the fine jewelry appraisal. In this case, the necklace took 137 diamonds and the total diamond carat weight came to 10.40cttw. Our lucky customer got even more diamond carat weight than the advertised 10.00cttw that you see on the site. After the diamond setter has finished setting all the diamonds, the necklace goes for a final polish, rhodium plating (in this case because it is 14kt white gold), and final quality control inspection. You can read more about our thorough quality control process here. All of the steps that we take are critical to the outcome of the piece. Here is the final necklace you can see on our Instagram page . Lovely, isn’t it? Happy shopping!